Event Description : KIDS WORKSHOP : Hands On presents "Little Globetrotters"
Kids take a spellbinding trip through India - they climb over bridges built by weaving tree roots in the wettest place of the country, wind their way through Mumbai bylanes to watch the human pyramids reach for the ‘Dahi Handis’, dabble with the tribal art form of Gond and gape with amazement at a ‘guru’ which is a book. They discover many things about India as they explore cities & regions using hands–on learning games and activities. 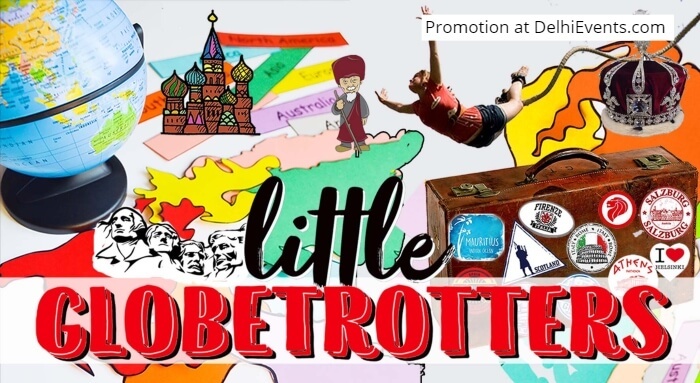 Inspiring Little Globetrotters to become curious travellers!